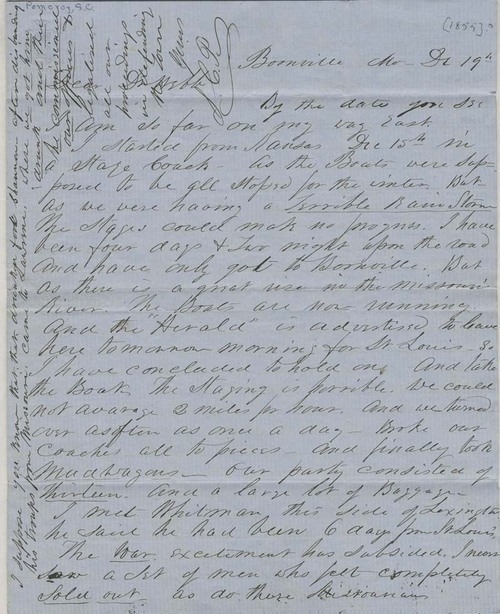 Samuel Pomeroy, writing from Boonville, Missouri, to Dr. Thomas H. Webb, secretary of the New England Emigrant Aid Company, described a dinner he attended in Lexington, Missouri with pro-slavery Missourians who had participated in the Wakarusa War. Pomeroy expressed the opinion that the Missourians drank too much alcohol but he reported that he had been allowed to express his anti-slavery views to the group. Pomeroy indicated that the Missourians were particularly upset with Governor Wilson Shannon's intervention in the Wakarusa War.